Are confirmed volcano eruptions increasing? Well not in the last 14 years as the graph clearly shows. 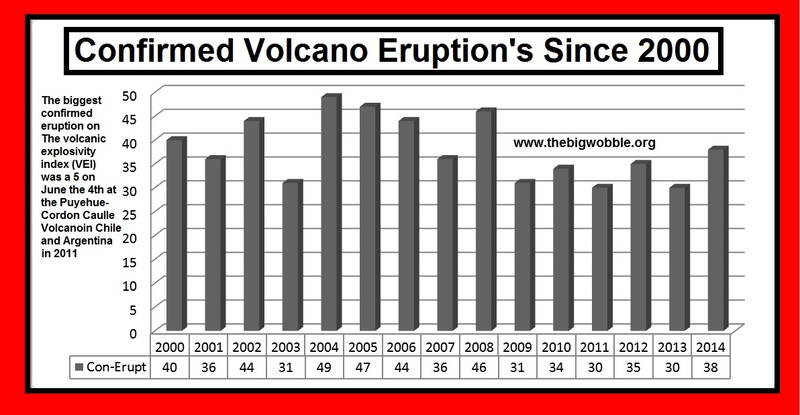 A total of 38 volcano eruptions where confirmed in the year 2014, as you can see on the wonderful graph below which falls into an average figure for the last 60 years or so. The largest eruption of the on the Volcanic Explosivity Index, ( VEI) in the last 14 years was a 5 on June the 4th 2011 at the Puyehue-Cordon Caulle in Chile and Argentina. The Mount Tambora (1815 eruption) was a 7 on the Volcanic Explosivity Index, ( VEI), responsible for 92,000 deaths, is the largest and deadliest volcanic eruption in recorded history. It was so large it caused the "Year Without a Summer" in 1816, see here and here. In 1833 the Krakatoa eruption killed 36,417, and scored a 6 on the Volcanic Explosivity Index, ( VEI) and was heard 3,000 miles (4,800 km) away. It caused a 5 year volcanic winter. The island had three volcanoes. Perboewatan (410 ft) and Danan (1,480 ft) was destroyed during the eruption while Rakata (2,667 ft) was only half destroyed but it still remains above sea level. In 1928, a new volcano called Anak Krakatoa (1,063 ft) grew above sea level, forming a new island by Rakata's island. These graphs are fraudulent and designed to be confusing. Perverting together amount of eruptions with power of eruptions that the graph is not taking into account. "reported" eruptions based on what scale of measure? including the continuous burpings of the Hawaiian volcanoes??? NO these graphs are skewed. How about you graph the amount of "dormant" volcanoes now springing back to life compared to past history - GRAPH THAT! I surely would if I had the data, maybe you could help me?